The discovery of Chronic Wasting Disease (CWD) in Norway in 2016 has led to extensive measures and testing of deer in Norway, and from 2018 also within the EU. But how many deer needs to be tested before we can be almost certain that a population is not infected by CWD? A new scientific publication provides important tools for estimation of prevalence and likelihood of finding infected animals in a given population. The paper titled “A method that accounts for differential detectability in mixed samples of long-term infections with applications to the case of Chronic Wasting Disease in cervids” is published in Methods in Ecology and Evolution. 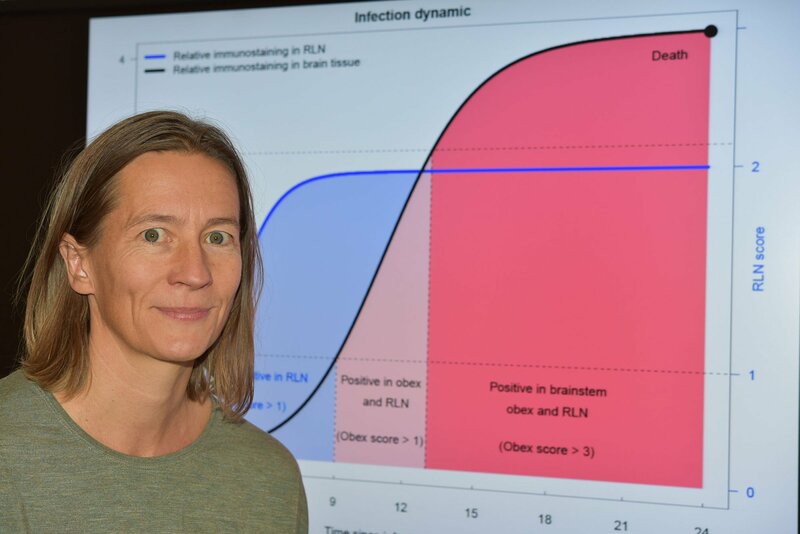 The paper is a result of a collaborative work between a multidisciplinary group of scientists from the Norwegian Veterinary Institute, Norwegian Institute for Nature Research and the University of Oslo. Will the infected animals test positive? – How certain can we be that an infected individual will test positive? In a long-lasting infection, like CWD, it is important to take into account the temporal pattern of test sensitivity. The model tool in this article deals mainly with estimating test sensitivity and how it is dependent on disease progression, the age of the animal and type of tissue tested. There are many applications for this model. We will use this model to determine when specific reindeer herds in Norway hopefully can be declared free from CWD, says Hildegunn Viljugrein, senior researcher at the Norwegian Veterinary Institute. Surveillance of wildlife diseases is in general logistically difficult and a recurrent challenge for disease estimation. We cannot test the whole population for CWD, as the current standard test requires samples from dead animals. The new model tool presented addresses a pressing need in CWD diagnostics, by taking into account the inconsistent quality of hunter-collected samples and the variability of prion deposition in target tissues with disease progression. In following-up work, the model will be used for estimating the probability of freedom from CWD for Hardangervidda and Nordfjella zone 2, the wild reindeer herds closest to Nordfjella Zone 1 where CWD was detected. Link to the article: A method that accounts for differential detectability in mixed samples of long-term infections with applications to the case of Chronic Wasting Disease in cervids.